The Turnberry Ocean Club will soon be complementing the Sunny Isles beach skyline. 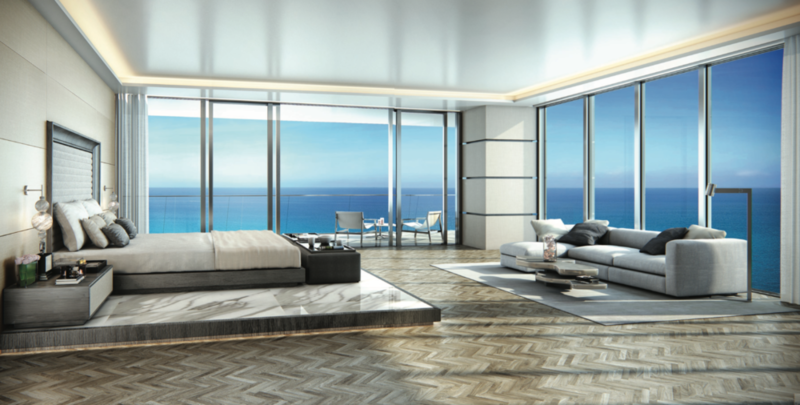 It will be towering at 54 stories over the beach, with 154 large and exclusive residences on 48 residential floors. A luxury skyscraper embodies the energy, the eye-catching Turnberry Ocean Club embraces the apex of Miami's modernity movement. The building residences with have balconies on all sides, with a maximum of four units per floor. The building will have 2 floor duplexes and 3 floors Triplexes available. 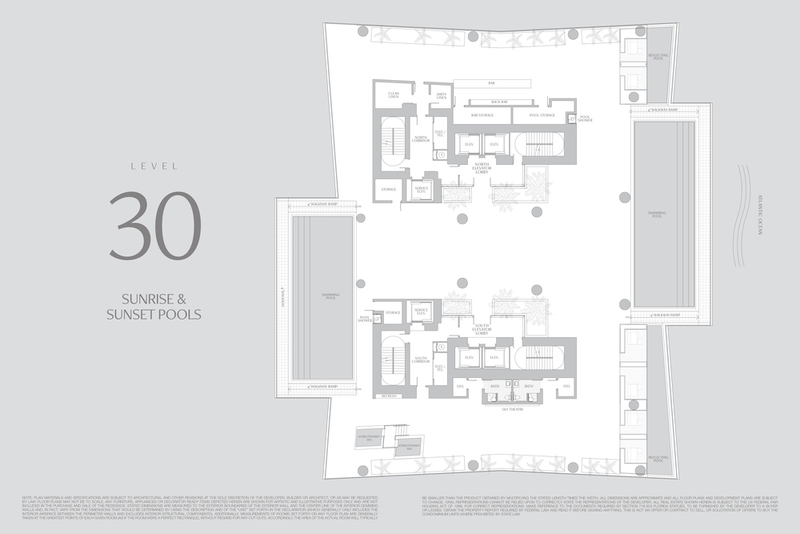 On 30th-floor the Turnberry Ocean Club swimming pools and an al fresco fitness center overlooking the ocean, all towering at 333 feet in the lovely Sunny Isles sky. 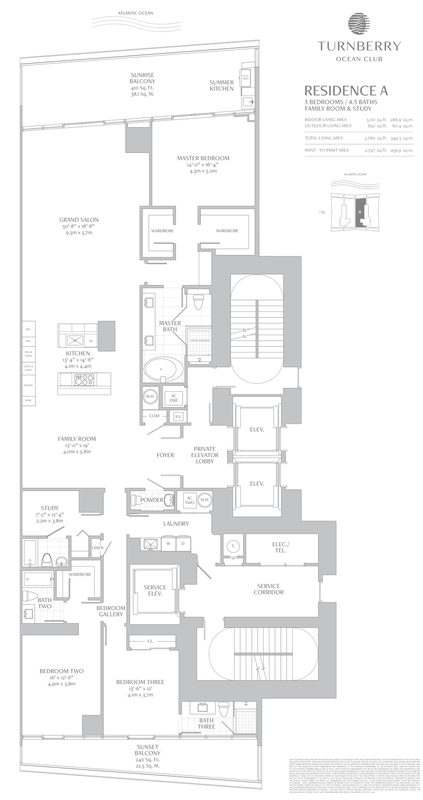 See floor plan here to this magnificent world of amenities called the Sky Club. As a resident of the Turnberry Ocean Club comes with privileges like membership to the Turnberry Isle Resort & Club with unmatched amenities, from championship golf courses and a 117-slip marina and yacht club to a triple-story high-design spa and restaurants at the forefront of Miami's exalted dining scene. Furthermore residents will benefit from world-class tennis thanks to an exclusive partnership with renowned tennis academy, Cañas Tennis. Visualize yourself arriving to a stunning lobby area with three-story glass windows with direct views to the open to the azure sea. Six amenity floors, three of which put you in the center of it upon arriving at your residence. 24/7 valet and security personnel. Lobby-level ocean view infinity pool with full poolside service. Private beach amenities including beach service, chaise lounges, and umbrellas. Pool bar and restaurant with full kitchen. Coffee bar and reading lounge. Indoor theater/screening room, seating 18 people. Kids’ Club – children’s multi-purpose playroom. Two association cabana-furnished guest suites. Private indoor/outdoor dining room with catering kitchen. Thirty-one ocean view cabanas available for purchase. Storage spaces for each residence. Additional storage rooms available for purchase. Limited self-parking spaces and garages available for purchase. Underground motorcycle and bicycle storage. Electric car charging stations and car wash area in garage. High-speed internet in all common areas. Membership privileges available at Turnberry Isle; resort, including: golf, tennis and marina activities (monthly dues not included in condominium maintenance). 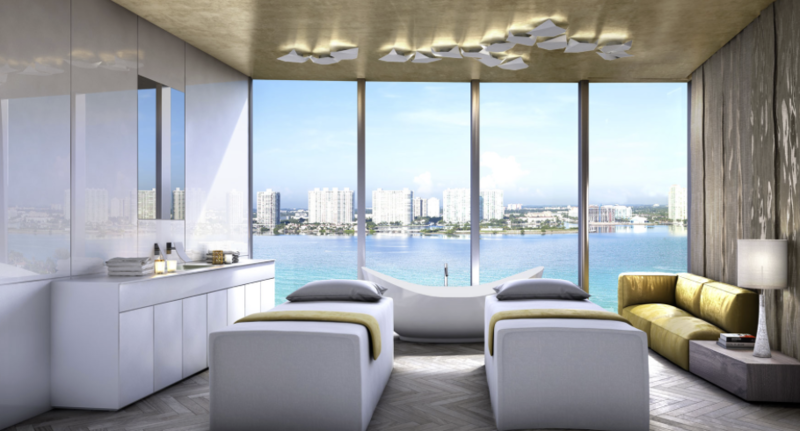 154 flow-through residences with direct ocean and bay views. 54-story modern glass tower by Carlos Zapata. Four flow-through residences per floor. Six high-speed elevators per floor. Premium services and unparalleled amenities. Functional, efficient space planning and overall design by Robert Swedroe. Dramatic arrival entrance with multiple water features. Three-story glass lobby with direct ocean views. Imagine emerging yourself into a relaxing workout, enjoying the sunrise & sunset sky pools and outdoor bar, simply having a private outdoor or indoor dining experience on the lounge, or taking your pet out into the pet retreat. All on your own Sky Club that is 3 stories high on levels 30, 31, 32. Sunrise & Sunset Swimming Pools. Men's & Ladies' Locker Rooms With Steam Showers & Saunas. Spacious Indoor & Outdoor Dining Areas With Catering Kitchen. Sunset Lounge & Social Room With Indoor & Outdoor Bar. Outdoor Pet Retreat & Dog Walk Area. 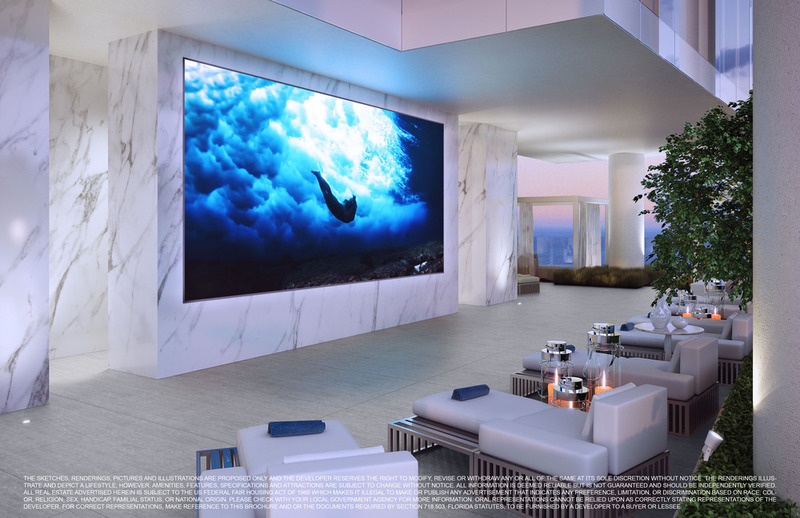 Now that we know what to expect from the Turnberry Ocean Club building itself, lets look a little deeper to the type of residences and options that it has to offer. They will truly emerge you on their beauty, and make you want to call this place home. 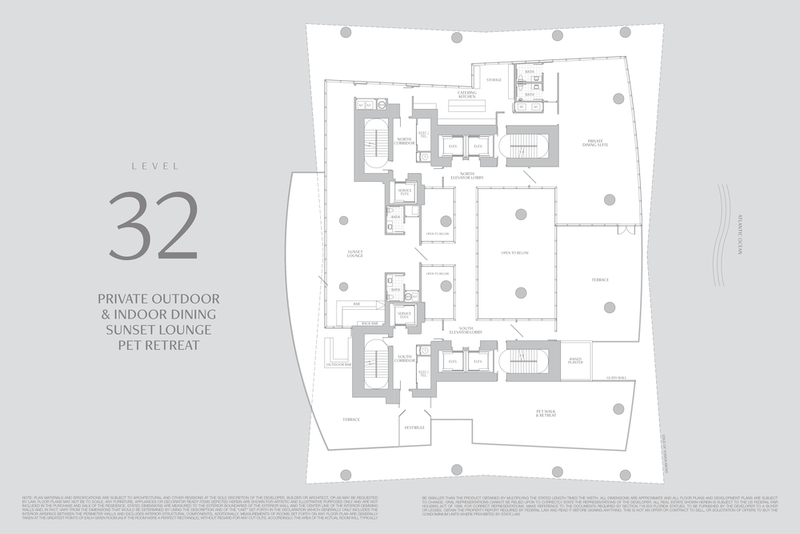 Each residence features a family room and staff quarters with full bath and closet. 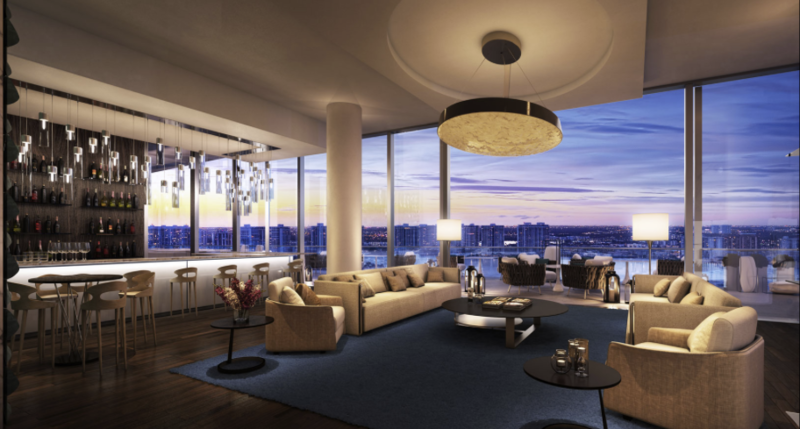 Collection duplex residences have 20-foot-high living room and balcony ceilings. Residences have an eleven foot deep, oceanfront balcony as well as a balcony overlooking the bay. Residences feature a summer kitchen with BBQ grill on the oceanfront terrace. Private pools and hydrotherapy spas in Collection Residences. Three high-speed, direct elevators serving each residence. Imported Snaidero Italian custom cabinetry in kitchens, bathrooms and laundry rooms. 24” Built in coffee maker. 18” Tall wine climate storage. Electrolux super capacity, front load, washer and dryer. All bathrooms feature marble walls and flooring. Duravit all-in-one toilet/bidet in every master bathroom. Prime coat finished walls and imported interior doors. Vali and Vali door hardware. The Turnberry Ocean Club will be an amazing project, a luxury tower containing more than just efficient floor plans and an innovative design; the tower has its own soul and will provide a lifestyle and a level of service that is unrivaled. The Turnberry Ocean Club will stand tall above all. If you have any questions, need more information, or to schedule a private showing do not hesitate to contact me. Thank you for your message, I will be contacting you about Turnberry Ocean Club soon.